“I'll say it once more. 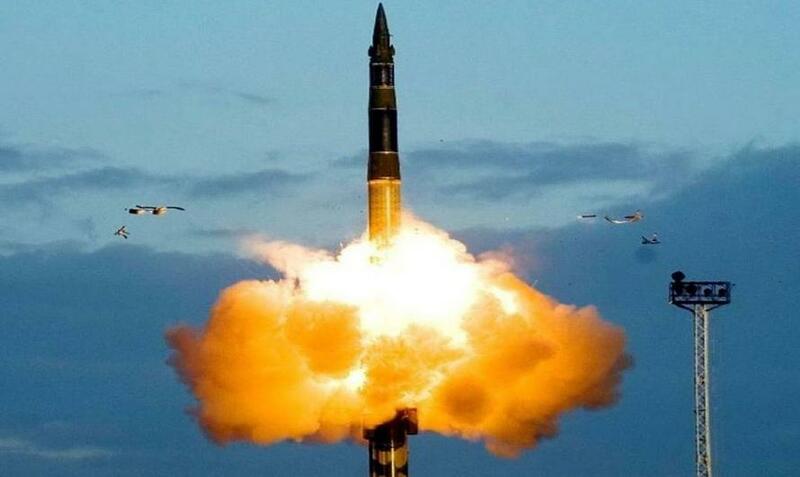 We have the ability to develop and produce our own nuclear weapons, currently available in the world, such as the one that was built in the former USSR and which is now in independent Ukraine, located in the city of Dnipro (former Dnipropetrovsk) that can produce these kinds of intercontinental ballistic missiles. Neither the United States, nor Russia, nor China have produced a missile named Satan … At the same time, Ukraine does not have to worry about international sanctions when creating these nuclear weapons." The issue of nuclear weapons has always united the great powers, especially following the signing of the Non-Proliferation Treaty (NPT). The decision to reduce the number of nuclear weapons towards the end of the Cold War went hand in hand with the need to prevent the spread of such weapons of mass destruction to other countries in the best interests of humanity. During the final stages of the Cold War, the scientific community expended great effort on impressing upon the American and Soviet leadership how a limited nuclear exchange would wipe out humanity. Moscow and Washington thus began START (Strategic Arms Reduction Treaty) negotiations to reduce the risk of a nuclear winter. Following the dissolution of the USSR, the Budapest Memorandum on Security Assurances persuaded Ukraine to relinquish its nuclear weapons and accede to the NPT in exchange for security assurances from its signatories. Ukraine has in recent years begun entertaining the possibility of returning to the nuclear fold, especially in light of North Korea’s recent actions. Kim Jong-un’s lesson seems to be that a nuclear deterrent remains the only way of guaranteeing complete protection against a regional hegemon. The situation in Ukraine, however, differs from that of North Korea, including in terms of alliances and power relations. Kiev’s government came into power as a result of a coup d’etat carried out by extremist nationalist elements who seek their inspiration from Nazi collaborator Stepan Bandera. The long arm of NATO has always been deeply involved in the dark machinations that led to Poroshenko’s ascendency to the Ukrainian presidency. From a geopolitical point of view, NATO's operation in Ukraine (instigating a civil war in the wake of a coup) follows in the footsteps of what happened in Georgia. NATO tends to organize countries with existing anti-Russia sentiments to channel their Russophobia into concrete actions that aim to undermine Moscow. The war in the Donbass is a prime example. However, Ukraine has been unable to subdue the rebels in the Donbass region, the conflict freezing into a stalemate and the popularity of the Kiev government falling as the population’s quality of life experiences a precipitous decline. The United States and the European Union have not kept their promises, leaving Poroshenko desperate and tempted to resort to provocations like the recent Kerch strait incident or such as those that are apparently already in the works, as recently reported by the DPR authorities. The idea of Ukraine resuming its production of nuclear weapons is currently being floated by minor figures, but it could take hold in the coming months, especially if the conflict continues in its frozen state and Kiev becomes frustrated and desperate. The neoconservative wing of the American ruling elite, absolutely committed to the destruction of the Russian Federation, could encourage Kiev along this path, in spite of the incalculable risks involved. The EU, on the other hand, would likely be terrified at the prospect, which would also place it between a rock and a hard place. Kiev, on one side, would be able to extract from the EU much needed economic assistance in exchange for not going nuclear, while on the other side the neocons would be irresponsibly egging the Ukrainians on. "We were ready to do it [putting Russia's nuclear arsenal on alert]. Russian people live there, they are in danger, we cannot leave them. It was not us who committed to coup, it was the nationalists and people with extreme beliefs. I do not think this is actually anyone's wish – to turn it into a global conflict." As Kiev stands on the precipice, it will be good for the neocons, the neoliberals and their European lackeys to consider the consequences of advising Kiev to jump or not. Giving the nuclear go-ahead to a Ukrainian leadership so unstable and detached from reality may just be the spark that sets off Armageddon.